Laura Kinney also known as X-23 is the Wolverine female clone in the Logan movie. Laura Kinney also known as X-23 is the Wolverine female clone in the Logan movie. She is played by Dafne Keen, an eleven years old actress. The jacket that Dafne Keen wears in Logan for her X-23 role is a jean jacket with rhinestone buttons and two frontal pockets. The jacket is the Levi's Girls' Indigo Muse Denim Jacket . 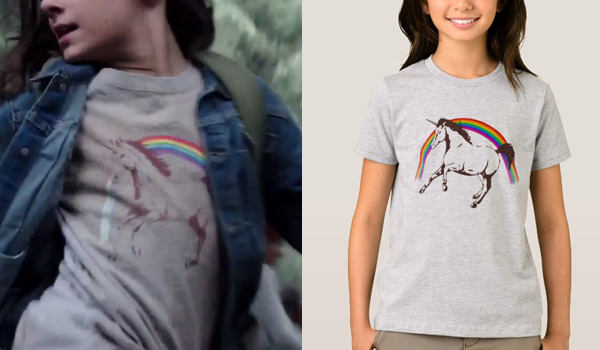 The tshirt that Dafne Keens wears in Logan for her Laura Kinney/X23 role is actually a tshirt-dress, it is grey with a rainbow and a unicorn. The t-shirt is unidentified but a replica has been made. The sunglasses that Dafne Keen wears in Logan for her X23 (Laura Kinney) role are pink and blue with a pattern on the front and text on the right arm. They are Little Sweetie Sunglasses. The backpack that Dafne Keen uses in Logan for her X23 (Laura Kinney) role is a green rucksack with a simple closing straps and 2 leather lash points on each side (to which she has attached a lucky charms). It is the Patagonia Kids Bonsai Backpack in Spanish Moss color. Unfortunately this exact color is discontinued but the model still remains. 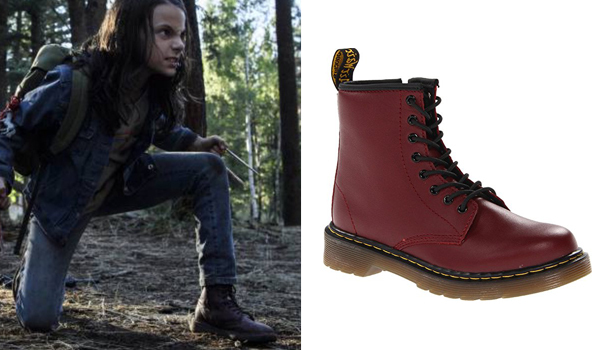 The shoes that Dafne Keen uses in Logan for her X23 (Laura Kinney) role are dark red boots. The Dr. Martens Delaney Boots are a close match. 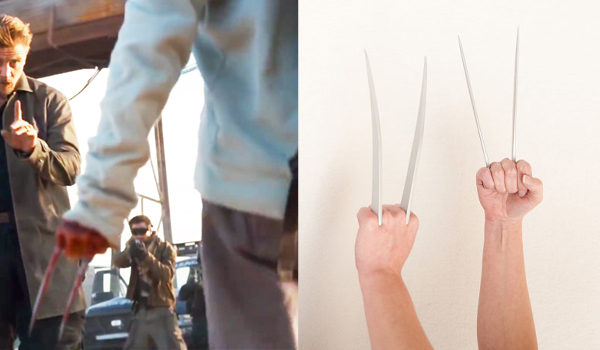 These claws are replicas from the Logan movie, made with resin and painted in a metallic color for safety. Hey, thanks for your comment, if you find a better t-shirt please let us know ! Jerry – how much do you charge and can I purchase a t-shirt dress through you? My daughter is putting together an X 23 cosplay and I have been searching for one. I have found a few better t shirts, https://www.spreadshirt.com.au/x-23+laura+unicorn+t-shirt+logan-A108313643?department=2&productType=347&color=CBCBCB&appearance=231&view=1 is a good link for anyone who lives in australia, In regards to the jacket, it’s not on the amazon link anymore but there are many similar jackets like it, just type up levi’s original trucker jacket and you’ll find some similar options, although they are all pretty expensive. aww thank you so much for finding it though! do you know of any good dupes? Managed to grab one (the last of the last!) from a fashion store in Japan. 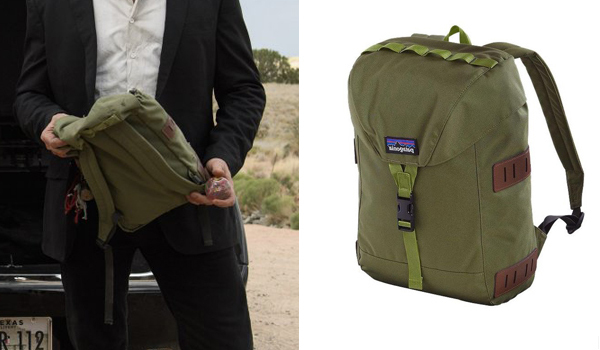 The actual model Patagonia Bonsai 14l backpack) with the exact same color (SNM -Spanish Moss green). Thanks for your reply! I enjoy the guide. And the cold coat that x-23 uses? What shoes was she wearing? Where they boots? I can’t remember. Oh yeah, pretty close ! Nice catch ! Good news! Pan Ocean Eyewear who originally manufactured the sunglasses put the sunglasses back in production. They’re for sale on Amazon (although they know they’re valuable so they’re charging $30 instead of $5 like they used to be). Still WAYYY better than $300 on EBay.